rocky's bru: KLIA2: Whose head will roll? Updated: In his posting about "competent (and consistent) liars", Big Dog trains his barrel at Tony Pua and Nurul Izzah, the Pakatan duo who have angered many for calling MAHB top execs, including its CEO Bashir Ahmad, "a team of incompetent liars" for the delay in the completion of KLIA2 without "proper facts or basis". The good, the bad and the ugly. A man is as good as his word, and Hishammuddin Hussein, the acting Transport Minister, has given his word that the KLIA2 will be delivered by end-April 2014. Hats off to him for refusing to be drawn into the finger-pointing game: Just get it done, he told the parties involved after visiting the site last Friday. Loud and clear, no pettiness involved. To facilitate, a special committee headed by the Deputy Minister of Transport has been set up. The committee will meet regularly to make sure, among other things, that the contractors DO invest the required resources in the project to complete the job on time and that the end-users DON'T make anymore ridiculous demands on "their" so-called low-cost airport. I was told Malaysia Airports Holdings Berhad had to accommodate over 100 changes to the original design of the KLIA2 since the start of the project. The last demand was made end-May this year, just a month before the deadline (which was eventually missed)! As importantly, in my opinion, the committee will shield the parties involved - the contractors, the airport authorities and the end-users (or the good, the bad and the ugly, not necessarily in this order) - from malicious attacks and wild allegations by ill-informed outsiders, especially politicians, and sneaky enemies within. YB Tony Pua, for example, isn't the only one and certainly not the first to point fingers at the airport authorities; in fact, some people believe the DAP sweeper is actually doing the bidding for powerful people who have been wanting to get rid of the Bashir Ahmad, the internationally-acclaimed chief executive of MAHB. He's even resorted to calling Bashir's execs "a team of incompetent liars". 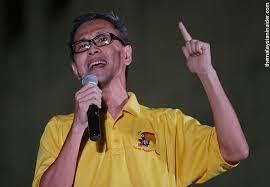 Unfortunately for Pua, Bashir has proved too formidable - PM Najib Razak extended his tenure last month amid the incessant calls for his head over the KLIA2 delay. From within, I read with disbelief the call made by Apprentice Asia tv star Tony Fernandez's girl Aireen Omar for an independent panel to probe the KLIA2 delay. Is she too green or too blind to see that Air Asia has been one of the primary reasons for the delay? Or, perhaps, the Air Asia chief executive is doing whatever needs to be done so that Tony F won't tell her, "Youi're fired!" Some people put the blame squarely on UEM-Binapuri, the contractors. The dude from Binapuri has, in turn, put it down to the fickleness of the end-users, which should include Aireen Omar. A panel will probably tell us who (besides Air Asia) has been at fault but it won't ensure that the airport will be complete as scheduled. Hshammuddin's committee, on the other hand, has placed both authority over the entire project and accountability in the event of a failure. If anyone has a problem with KLIA2 after this, take it up with Abdul Aziz Kaprawi. I hope the Deputy Minister has been warned about the powerful and sneaky characters he will be dealing with. The only way for his Committee to succeed - and ensure the Rakyat get a bigger and better KLIA2 and on time - is to be brutal, honest and transparent. Definitely NO ONE. UMNO people protect each others. Tabiat yang dah sebati. As they say, a camel is a horse invented by a committee. A non-independent government appointed committee is more likely to cover up fraud and cost overruns than shield anyone from "malicious" attacks. As for the 100 changes, before KLCC or KLIA were completed, Mahathir orderd more than a thousand changes from the original plans. So, the key question is were they necessary from a commercial, safety, practical and user-friendly point of view or, for cosmetic and impractical purposes? Surely it's reasonable to assume MAHB, which holds all the aces, would not have agreed to any changes if they were unnecessary? You mean Tony had something to blackmail Bashir with that MAHB should agree to even ridiculous plan changes? So, there's no way Air Asia can be faulted for the KLIA2 design if MAHB overlooked many important airport features. Bashir - "internationally acclaimed CEO."? Really? For running a monopoly handed on a silver platter, and which would be so much the poorer without Air Asia's business where MAS has be stuttering and sputtering despite government bailout of over RM 10 billion over the years? One should research matters and think through logically before indulging in their favourite past-time of DAP and Air Asia bashing! Bashir too formidable to Najib? Are you talking about the PM being scared of Bashir!? Rocky, its improbable even coming from you. Unless of Course you think that the PM is A Whimp. Well done Rocky. Hit it hard. Rocky : " Bashir Ahmad, the internationally-acclaimed chief executive of MAHB"
sure or not ?? don't simply grade our hero here !! There are so many airport builders, managers and operators in the world, mate, not one. And for your info, MAHB has to compete with all of them and not just with itself in order to win contracts and maintain airoprts. Bashir and team are assessed based on their performance at international level, not just on domestic front. So how does that make it a "monopoly"? Takyah dilayan si koliang DPP tu. Bunyi macam pandai tapi bodoh na mampus. Kalau kau tunjuk pen biru depan dia dan kau katakan pen ini biru, dia akan kata merah pasal dia tak mahu percaya apa yang kau katakan. Dia juga kata merah pasal dia tak boleh bezakan antara biru dan merah. Dia menjadi kritikal dan menentang kerana dia nak tunjuk dirinya yang bodoh kononnya pandai. lack of detail planning is what i see in the delay. in all respect, the required scope and requirements should have been formalised prior to initiation of the project. if the project was launched without due consideration of all major stakeholders requirements, and there isn't a proper working paper and proposal to being with, then it is just implementing based on the quickest way possible by bringing in the contractors to carried out the necessary design and build which is almost a sure way of getting it the proposed budget and timeframe needed. and this is only a small part of the entire process. setting a committee at this level means the project is in dire consequences of not meeting all the contractual obligation of the project. the question is, isnt't the team of consultants and contractors professional and qualified sufficiently to drive the project to the necessary criteria? and what about the sponsor and owner obligations? as stakeholders in the project, they have to fulfill certain contractual obligation being the paymaster. here in malaysia, paymaster literally means, "i am the master, you are the slave". owners are obligated to provide sufficient data on their requirements for the consultants and contractors to build according to specifications. in this construction industry, it is either the linear, incremental, iterative models of process adopted when requirements are either good enough or require further research along the project duration. whereas, adaptive and extreme models are used mainly for projects when no specific goals or results. this usually invovles research and development products/projects. it seems from what i read, the project is still going thru changes and i will fault the consultants and owners for not furnishing the required information to complete the project. contractors are tasked only to build according to the owner requirements thru the specifications and documents compiled by the consultants. even if a committee is to look into all these aspects, the changes and alteration will show great variations between what was originally intended to build and what is required now. this also means there are no risk mitigation management on the part of the consultants. So Rocky, has anyone else besides MAHB built or managed the project for construction of an Airport in Malaysia? Also, this is probably the first time the end user is being blamed for delays in completion. Come on la old man, if you want to spin and abide to your masters, at least make an attempt to spin believably? As far as I know, and I stand corrected and apologise if I am wrong, MAHB was hived off from the old Department of Civil Aviation (DCA), and given a virtual monopoly to manage almost all airports in Malaysia, including Sabah & Sarawak. It's overseas projects including JV at DOHA are few. Those would all have been on open tender basis. But we are not talking about that because,currently, I would guesstimate that some 95%-98% of its revenue and profits are derived locally. In 2012 MAHB's revenue included RM1.38 billion contribution from on-going contract for KLIA2 construction, out of total revenue of RM3.5 billion. MAHB's Principal Business, as stated in its 2012 audited accounts available online at Bursa is "broadly classified under aeronautical and non-aeronautical revenues." Non-areonautical revenues include palm oil, Sama Sama Hotels and airport construction. There was no open tender for award of KLIA1 or KLIA 2 airport construction or management. In fact the Tony Fernandes-Sime Darby JV which said they could build the original KLIA2 for RM1 billion were told by Najib (as "advised" by EPU - Economic Plundering Unit) that by law MAHB had a monopoly on it. So, no question of open tender there or for Penang Airport construction. Now the expanded KLIA 2 will probably come in closer to RM 5 billion with cost overruns! Trust the monopoly picture is clear. Rocky, you and your band of bloggers are always super defensive of MAHB and Bashir. Is there something going on here that you're not telling us? Tony of A Asia had engage Dato Jamlus to make an assement on KLIA2. According to Dato Jamlus,the earliest the KLIA 2 can be completed is on sept 2014. Dato Jamlus was the consultant to built KLIA 1. I just winder why MAB didnt use him when they want to constructed KLIA2. spence66, you said it right. I hear that Air Asia has not made the necessary preparations to move to KLIA2. Perhaps Dato Jamlus has been informed of this, hence the Sept 2014 completion date he's suggesting? It's indeed a strange project where the project specs weren't frozen well before work on the project commenced. There's more in the KLIA2 story than meets the eye. So, who's to blame for the delays and cost overruns? MAHB? It's clients - the airlines? The project contractors? Or the government? What bloggers such as Big Dog and myself have been doing is to tell you what Tony Pua and Nurul Izzah have been hiding from you or don't wish you to know. They know it's easier to deal with fools but we have no interest in the gullible, so we're here to help inform or/and educate you so that you don't remain easy picking for them. Rocky baru habis minum dgn Basher...patutlah bermati-mati pertahankan Basher yg incompetent tu. lepas tu Rocky pulak akan support sama Chairman Azeeeeeeeeeeeeeeez, boleh dapat free tiket ke mekah tahu !! Rocky stop shitting and stirring at the same time! Your FAV CEO IS THE BOSS and he fcuked up thats all! Everyone knows why the delays so as to expand their side income....this dirty game was the same when mahakutty built KLIA ...everything with super excuses from maha with cost escalating upwards was the excuse....ini bolehland lah! Keling Dont Play Poockey bantai buta ja. Memang Malaysia Airports ada monopoli keatas semua lapangan terbang. Tapi banggang cam dia tak mungkin sebut yg Malaysia Airports subsidi-lintang 80% lapangan terbang dlm negara ni. Cukup ke cukai penerbangan yg Malaysia Airports kutip utk operasi lapangan terbang cam Alor Setar, Melaka, Bintulu, Tawau, Labuan & tempat tenpat cam Kapit atau Long Pasia? Apasal Keling bebal ni tak sebut pun takda satu pun lapangan terbang utama di Amerika Syarikat yg diurus secara swasta? Really, Bru. Do you believe that MAHB is doing a great job? What's your objective basis for saying this? Have you checked the latest Skytrax 2013 World Airport Awards? The top 10 airports are (in descending order): Singapore Changi, Incheon International, Amsterdam Schiphol, Hong Kong International, Beijing Capital International, Munich, Zurich, Vancouver International, Tokyo International (Haneda)and Heathrow. Where is KLIA? If memory serves me right, it ranked among the world's top 5 airports some years back. How did it slide down the rankings? To salvage some of MAHB's pride, KLIA is ranked #3 among airports in the 30-40 million passengers a year category. And KLIA is ranked #1 among airports as providing the Best Airport Immigration Service (though how much of that can be credited to MAHB is debatable). Here's a question, Bru. When was the last time you transited through, or took a flight from, Changi Airport? Can you honestly say that KLIA is comparable, or better, than Changi in service standards, facilities and amenities? Since we are on the subject of air transport, I note that MAS has dropped out of the Skytrax 2013 World's Top 10 Airlines rankings, coming in at #14. This wouldn't be so bad, if not for the fact that Garuda is ranked #8!